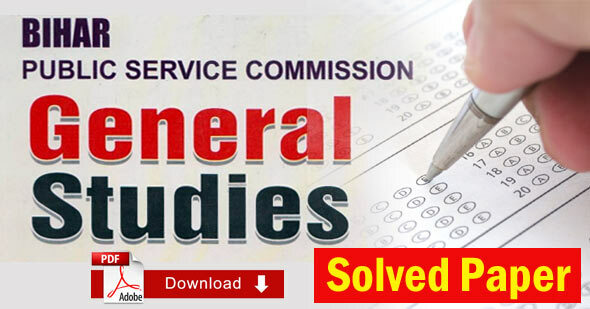 BPSC General Studies Question Paper 2018 PDF: The BPSC Prielms Examination 2018 was organized on December 16, Decemeber 2018 on its scheduled day at various examination centers. This was the 64th BPSC preliminary examination, in which 150 General Studies Questions were asked. By studying this paper, you can achieve success in the SSC, Sub-Inspector, Section Officer, Tax Assistant, Combined Graduate Level Tier-I & II, SAS, CISF ASI, CPO ASI & Intelligence officer, FCI, Police, Data Entry Operator & LDC, Stenographer Grade examination of other states along with the upcoming BPSC examination. 21. Defence Minister of India Smt. Nirmala Sitharaman made a three-day visit to which nation in the first week of October 2018 ? 22. The Parliament of which of the following nations dismissed the honorary citizenship of Aung San Suu K yi in October 2018 ? 23. Which of the following is not associated with NAFTA ? 24. With which nation has India signed an agreement 'Mobilize Your City' in September 2018 ? 25. Where did Foreign Minister Smt. Sushma Swaraj inaugurate 'Panini Language Laboratory' in August 2018 ? 26. Which nation enacted 'Human Organ Transplantation Law' for migrants from Indian origin in August 2018 ? 28. On 20th July, 2018 which nation ended emergency after two years? 29. Which of the following nations declared emergency due to polio outbreak in June 2018 ? 30. For how many times did India win the Cricket Asia Cup on 29th September, 2018 defeating Bangladesh ? 31. Which of the following is the correct order of medals won by India in the 18th Asian Games, 2018 (Jakarta) ? 33. In June 2018 how much amount has the World Bank approved for 'Atal Bhujal Yojana' an ambitious scheme of India? 34. According to the report of lIT, Kharagpur study group, continuous low rainfall for how many years was the cause of fall of the Indus Valley Civilization? 35. According to Indian Forest Status Report released in February 2018, how much area of India is covered by forests ? 37. Which district achieved the first position as per 'Swachh Sur- vekshan Grameen, 2018 ? 38. Which scheme was recognized as world's largest insurance scheme launched in India in September 2018 ? 39. In which of the following institutes was the first Indian Railway University established in September 2018 ? 41. In which city / State was air pollution control system 'V A YU' installed in September 2018 ? 42. Under which of the following did Chief Minister Shri Nitish Kumar launch more than 750 development schemes at Begusarai and Khagaria districts on 6th January, 2018? 43. In which city did, Deputy Chief Minister Shri Sushil Modi inaugurate Bihar's first 'Start-up Hub' on 16th March, 2018? 44. On 22nd March, 2018 who unveiled the book, 'Neel Ke Dhabbe' on the occasion of 106th Bihar Day in Patna? 47. In which airport did NOMA conduct a mock drill based on CBRN emergency in April 2018? 49. In which city of Bihar did Sulabh International launch cheapest drinking water project 'Sulabh Jal' ? 50. Which of the following is not true about Bihar's Mukhya- Mantri Kanya Utthan Yojana? 60. Who among the following rulers divided his troops into units of two hundred, two hundred fifty and five hundred? 62. Which Sultan was reputed to be Akbar of Kashmir' ? 73. In which of the following areas, does Mediterranean climate not prevail? 75. Which one among the following countries of the world, except United States of America, is the largest crude oil producer? 81. After Independence, in which year were the Indian States reorganized on a linguistic basis? 82. Which one among the following States of India is called 'Sugar Bowl'? 83. In which one of the following minerals, does India lead in production in the world? (C) Gypsum (D) Iron ore.
90. Which types of industries have potentials and prospects in Bihar? 98. Which one of the following Articles directs the State Government to organize the Panchayats? 100. In which one of the following years did Sarkaria Commission, which was empowered to recommend changes in Centre State relations, submit its report? 115. Which one of the following States has the highest density of population according to the Census of India 2011? 118. In Bihar, during April-June 2018, which sector has attracted the highest FDI equity inflow? 121. Which of the following was not a reason for making the sepoys of the East India Company rebellious ? 126. Rajani Palme Dutt said, "They both fought and collaborated with imperialism." Which political grouping was he referring to ? 132. The Jallianwala Bagh Massacre happened in the context of which Gandhian Satyagraha ? 135. "So always with the assent and often to the dictates of the Chamber of Commerce, the Government of India is carried on, and this is the 'White Man's Burden'. " Who said this?